I'm teaching three sections of sixth grade Language Arts this year. I'm loving it, but struggling to stay on top of the teaching, and also blog. Phew! One of the hardest things for me has been the 50 minute periods. That's not very much time at all. Before the year started, I promised myself that I was going to read aloud to my sixth graders every single day. Originally, I planned to read a chapter book, and had chosen, Dan Gemeinhart's SOME KIND OF COURAGE as my first read aloud. When the year started, however, I discovered I had three students who spoke no English, and three more with less than a year of English under their belts. I decided, then, to start with picture books. Each week I have chosen books that were somehow connected. Last week, I chose "friend" books. 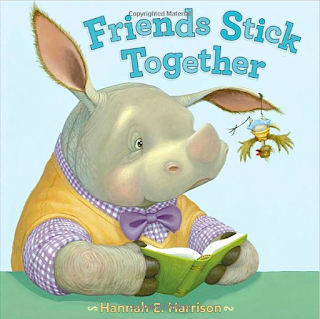 FRIENDS STICK TOGETHER, by Hannah E. Harrison, was my sixth graders' favorite read aloud. Rupert the Rhino is a bit staid. He likes reading the dictionary, listening to classical music, and eating cucumber sandwiches with no crusts. Levi the tickbird is quite the opposite- he loves corny jokes, armpit farts, and popping wheelies. Rupert is a more than a little unsettled when Levi moves in and upends his life by playing epic air guitar solos, burping the alphabet, and picking ticks off Rupert during lunch, "Tastes like chicken!" Rupert does everything he can think of to get Levi to depart (one of my students' favorite pages was Rupert on the merry-go-round, using centrifugal force, and then barfing in the trash can). He finally asks Levi to leave, saying, "I find your boisterousness a tad loathsome," and "Your uncouthness is slightly problematic. Predictably, after Levi is gone, Rupert discovers that he misses him, and has to make a visit to Levi's trailer to invite him to come back. My students and I loved pretty much everything about this book-- terrific humor, fun illustrations, and great vocabulary. I thought the design was total genius--Harrison begins and ends with a dictionary entry for the word symbiosis. We discussed this briefly when we started, I pointed out several examples during the book, and then we returned to it at the end. A few minutes later, during independent reading time, one of my students was thrilled to discover a section on symbiotic relationships in the WHO WILL WIN series. A perfect example of why it's important to read aloud to big kids! I've been in the same book club for over twenty years. We aren't a super serious book club- pretty much, we choose a book the month, or maybe two months before, we read the book, or most of us read most of the book, we meet at a restaurant, we have food and adult beverages, we talk about the book for a little while, and then we move on and talk about other things. I generally am one of the people that read the book, but I often read it mostly in the week before book club. That didn't happen this month. Our September choice is EDUCATED by Tara Westover. I bought the book right after our last book club, when I happened to be at a bookstore with my mom. It's pretty long, so I decided I was going to try to read a chapter a day, to get through it by September 15. By Friday, I was about a third of the way in. I had had a really long week at school, and Friday night on the back porch with a book sounded just about perfect. I picked up EDUCATED, and before I knew it, it was Saturday night, and the housework wasn't done, but EDUCATED was. And all I can say is, "Phew! What a read!" EDUCATED is a memoir by Tara Westover, who was raised in a fundamentalist Mormon family in the mountains of Idaho. Westover was homeschooled until the age of 16, but most of her homeschooling consisted of working in her father's junkyard, often under really dangerous conditions. Westover and her siblings never went to the doctor, were never exposed to people of other races, had never even heard of the Holocaust. At 16, Tara, like one of her older brothers, left the family compound and went to BYU, then to Cambridge and Harvard. EDUCATION is the story of her transformation. It's a powerful and eye opening story. For me, though, the book spoke loudly about the experiences a reader brings to the page, and how that impacts the reader, and that's what I have continued to think about A subplot of the book, which actually plays a really central role, is about Westover's father, who she believes to be bipolar, and his impact on the family. Another subplot focuses on one of Tara's brothers, who also appeared to have mental health issues, and was physically and verbally abusive to his sisters and others in the community, but was defended and protected by his parents. Those stories spoke loudly to me, maybe even more loudly than the story of Westover's education. I leave the book with a zillion questions. What responsibility does a parent have to protect his/her children from the other parent, if he/she is mentally ill? Or from his/her siblings? At one point does one renounce his or her own children? When is it acceptable to renounce one's own family? A thought provoking, disturbing and exhausting read.